You don't have to go down to the floor to work your abs, and this quick workout proves it. Get ready to work your core while keeping your feet on the floor, all in three minutes! 1) March and Squeeze - Start with both hands straight up in the air and bring one knee all the way up while bringing your arms down, keeping your hands above your elbows and near your body, so your elbows and knee line up, with your knee in between both arms. As you do this, squeeze your abs. Return to the starting position and do the same thing with your other knee, and continue to alternate knees. 2) Elbow to Opposite Knee - Bring one arm up so your elbow is at chest height and your hand is above your elbow, and bring your opposite knee up while bringing that arm down so your elbow meets your knee (don't hit them together hard). As you do this, squeeze your abs. Return them back to their starting point and do the same thing with your other knee and elbow, and continue to alternate. 3) Straight Leg Raises - Keeping your leg a straight as possible, raise it up in front of your body with bringing the opposite arm down, reaching out your hand to touch your foot (or as close as you can get). Return them back to their starting point and do the same thing with your other leg and arm, and continue to alternate. 4) Rotate and Punch - Stand with your legs about shoulder width apart and rotate your upper body, throwing a jab out with your arm. Then rotate the other direction and jab with your other arm. Your feet should stay in about the same location the whole time, with just a little twist of the same foot of the arm that is jabbing to allow the body to rotate. 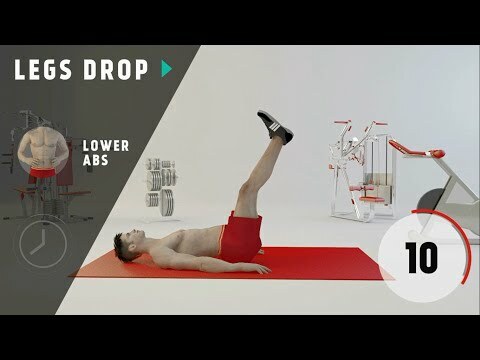 Do each of these exercises consecutively, for a total of three minutes, and you will have got an awesome ab workout while never going to the ground. You don’t have to go down to the floor to work your abs, and this quick workout proves it. Get ready to work your core while keeping your feet on the floor, all in three minutes! 1) March and Squeeze – Start with both hands straight up in the air and bring one knee all the way up while bringing your arms down, keeping your hands above your elbows and near your body, so your elbows and knee line up, with your knee in between both arms. 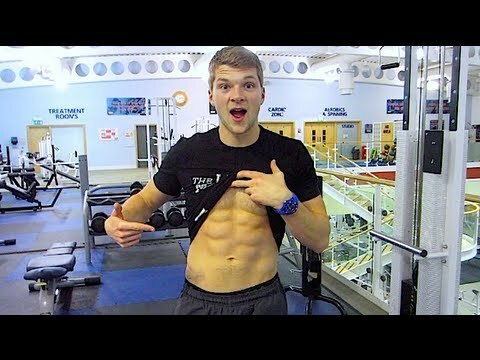 As you do this, squeeze your abs. Return to the starting position and do the same thing with your other knee, and continue to alternate knees. 2) Elbow to Opposite Knee – Bring one arm up so your elbow is at chest height and your hand is above your elbow, and bring your opposite knee up while bringing that arm down so your elbow meets your knee (don’t hit them together hard). As you do this, squeeze your abs. Return them back to their starting point and do the same thing with your other knee and elbow, and continue to alternate. 3) Straight Leg Raises – Keeping your leg a straight as possible, raise it up in front of your body with bringing the opposite arm down, reaching out your hand to touch your foot (or as close as you can get). Return them back to their starting point and do the same thing with your other leg and arm, and continue to alternate. 4) Rotate and Punch – Stand with your legs about shoulder width apart and rotate your upper body, throwing a jab out with your arm. Then rotate the other direction and jab with your other arm. Your feet should stay in about the same location the whole time, with just a little twist of the same foot of the arm that is jabbing to allow the body to rotate. My go-to workout for a quick, on-the-go, and workout. Perfect! I didn’t feel it in my abs..
so its as effective asgoing down the floor exercises? I felt them more in my legs than stomach. Is it OK? Love this ! It works! Thank you guys, that was helpful! Hi! How many times a week should I perform this workout? Can you tell me roughly how many calories this burns, please? Great little workout, have been doing it for 3 days now and I carry a lot of weight on my legs, so this is really good for working them out as well. Thanks very much! I am in Track, so I run a lot. My legs tend to hurt after so while doing these workouts, my legs started hurting. Is it okay to feel your legs as well?